“You get more self-aware because if you're angry the horse doesn't want to be by you. He's going to sense that it makes you become more self-aware about yourself and emotional state you're in...” An East [San Diego] County ranch is offering hope and healing to active duty military members, veterans and first responders suffering from post-traumatic stress disorder. The place is located in Creston, Washington, about 50 miles west of Spokane. It encompasses 220 acres and is home to 30 retired Thoroughbred racehorses. It’s called Down the Stretch Ranch. Over the course of the last three years it has also been a place that has hosted approximately 100 U.S. military war veterans, all of them battling post-traumatic stress disorder, on stays ranging from two days to two weeks. 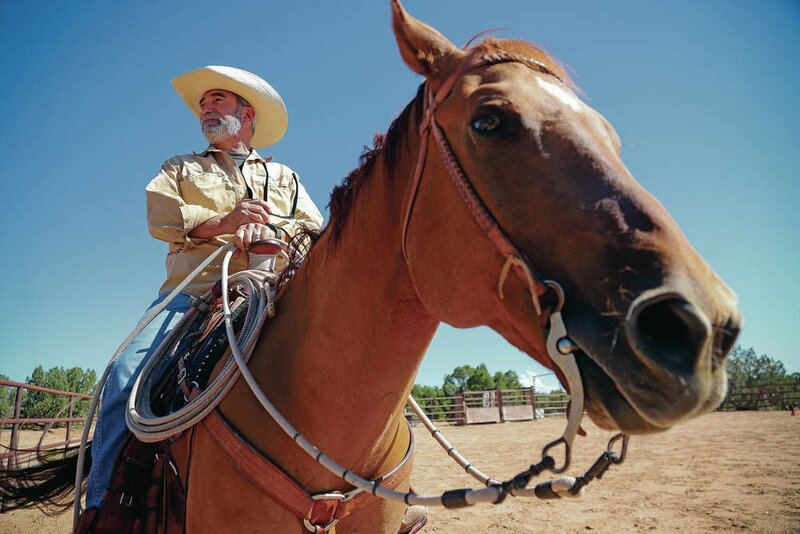 U.S. Army veteran Brian Ray was sitting tall in the saddle of a palomino quarter horse at the Crossed Arrows Ranch south of Santa Fe. The combat vet, who had spent three decades in the military, including two tours in Iraq as an adviser, focused his heart, mind and body on his connection with the horse. Therapeutic horse riding is clinically effective in easing the symptoms of post-traumatic stress disorder (PTSD) in military veterans, the findings of an American study suggest. The researchers also found that riding for longer appeared to improve the outcome for the troubled veterans. On a recent fall morning, four women inmates from Chester County Prison entered an indoor arena at the Thorncroft Equestrian Center and began to meet the duo who have been helping them navigate their way toward success outside of the prison walls. But Jubilee and Mia are not your traditional counselors or social workers. Owen McElroy says he spent years going to the doctor, trying to find out what was wrong with his hearing. The hippotherapy center designed to offer equine-assisted therapy for young locals living near the Şanlıurfa Hippodrome was established as part of a social responsibility project being conducted by the Jockey Club of Turkey (TJK).